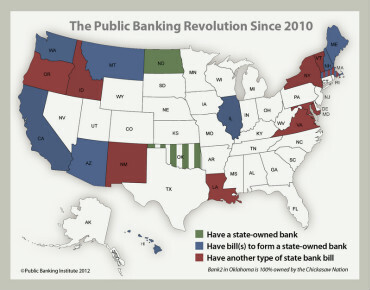 As the article has correctly hinted, it is not only States that can (and should immediately) install their State Banks. Counties and even cities can follow this model. In the case of a city or town, it provides the pool of capital to build both housing and factory buildings to provide cheap work space for the local folks. For example, a town in a woodlands area can use its revenues to acquire land and erect a building for a sawmill, then rent it to an Operator with the proviso that the local population shall be the workforce. If the effective cost of capital is 0.0018 and the revenue from the rents is 3%, the Town gains a nice return plus has new industrial land in development and provides for stable work for the locals. Who needs Wall Street? Answer: nobody. It is wonderful to hear that seventeen states have already introduced bills for state-owned banks, others are being worked on, and that Hawaii’s state bank bill addresses the foreclosure mess. That is great and encouraging news, despite the current setback in the settlement between the 49-state AGs and the big five robo-signing banks. One of the many reasons that I like the way the Bank of North Dakota is set up is that when money is deposited there, it flows back into state. Wouldn’t it be awesome if every dollar of profit by one’s bank, which could add up to tens of millions, were to flow back into the state and directly support the needs of the state in ways that private banks do not want to do, and will never do? We do not want to deposit our money in a bank that invests it abroad, or helps the speculators and big banks to just become bigger and more powerful. Applying a web of band-aids to the global debt-money Ponzi scheme will exacerbate the problems it has created. Examining censored history and understanding genuine economics, then building equitable and viable governance with legitimate elections and sound money can solve most of the problems we’re facing today in the USA and the world. Ellen, this is not germane to the post above, but please take the following thought to the upcoming conference. DEBT is a form of POLLUTION. Credit and fiat currency are like fossil fuels. They create big, fast-moving economies, but they also accumulate debt pollution until we have the current global catastrophe. Debt is killing us faster than all other forms of pollution combined. Indeed, it drives all other forms. It drives the mad quest to “grow,” which means nuclear power and the consumption of forests, fossil fuels, and other resources. Debt is also a force multiplier for human greed. Despite being the deadliest form of pollution, debt is also the easiest and quickest of all forms to cure. We only need to get rid of private ownership of central banks. (We need public central banks.) This will eliminate debt-based currency and fractional reserve banking. Remember: debt is the deadliest pollution. Banksters is how I see them! There was a time when robbers robbed the banks. Today the banks and the federal reserve are robbing the people. I want to participate in this group, please. Blue and red states, listen up. Why should anyone trust your new state bank? North Dakota was first (smarter than all other states?) therefore probably the best for investment in a state bank. We’ll see how you me-tooers are doing in about…oh, let’s say 20 years.